At Blaine Kennels Dog Squad, we specialize in hard to train dogs. We develop a training plan as unique as your pet. Including Cesar Millan, Todd Langston, Heather Mickelson, Joa Cristobal, and other leaders in dog psychology. Our unique approach begins with our instructors studying under some of the best trainers, handlers, and dog psychologists in the business. We’ve completed many hours of hands-on training seminars taught by the most famous Pack Leader in the world, the Dog Whisperer – Cesar Millan. Dog Squad’s Director of Training – Todd Langton – continues to work directly under and alongside Cesar Millan as his head instructor for Fundamentals of Dog Behavior I & II as he works with our team to create the best possible environment and experience for your dog. This unique insight and understanding of what drives your dog’s behaviors allow us to develop a custom plan to meet each individual dogs’ needs. 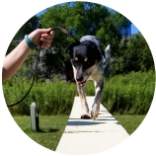 After completing Dog Squad Training Doggy Bootcamp, your dog will return as the very best version of itself and you will be given the knowledge and tools to maintain a state of balance and calm in your dog and your home. We train in real life situations, not just classes. Your dog will be happy, reliable, and obedient. We have been training dogs for 25 years. Our trainers have over 50 years of combined experience. We take great pride in our training success rate. We take dogs that other people won’t – regardless of age or special instructions. Our Dog Squad is a four-week intensive doggy “Boot Camp” for any level of training needed. Your pet will stay with us and is worked several times each day by different members of our training staff. 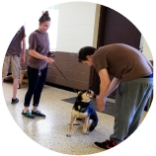 Our unique approach to obedience training allows a level of communication and understanding that you won’t get with other training methods. We specialize in working with hard-to-train dogs. With acres of fenced yards and multiple indoor and outdoor training areas, our natural setting allows your dog to play, explore, and relax. This makes them receptive to the training experience. With plenty of indoor and outdoor exercise areas, your tired pup will rest well on our Kurunda cots and heated floors. We have had a 20+ year relationship with the Blaine Kennels and Dog Squad Training. They have always been a dog training program that I have held as the gold standard. I was at the end of my rope and felt horrible, wondering why I adopted a third dog. I then looked online and found the Dog Squad, and I signed them up right away. We can now take the boys on walks with other dogs around the neighborhood. We LOVE the staff and the security that our dogs are in great hands. My wife and I have been taking our dogs to Blaine Kennels for nearly twenty years. Whether it’s training or boarding, pet products or advice, we have always found Blaine Kennels to be professional, informative, helpful and accommodating. Our dogs, Breezy and Misty, started visiting Blaine Kennels when they were 12 weeks old. At the end of their 6 month training program they graduated to working the birds of S.D. I could not ask for a better pair of hunting partners. My respect for the trainers at Blaine Kennels has gone to a new level. I have always liked Dale's methods as he does not believe in beating his dogs to arrive at a goal in training or to get compliance. Anyone can train a good dog! It is how one solves problems that separates the men from the boys. Our mission is to provide you and your dog with the best experience possible by listening to you and building a relationship with your dog.